Welcome to Jack’s Restaurant and Bar. Having grown up in the East Bay, my brothers and I are excited to have opened Jack’s in Pleasant Hill, San Bruno and San Mateo. We have been in the restaurant business since Chris was thirteen years old and David and I were fifteen.1 Our parents first put us to work at Eleni’s, their restaurant in Clayton. They employed us there not because we were particularly helpful but because The Fair Labor Standards Act of 1938 exempts one’s children from fair wages or labor standards.2 Of course, being teenagers, my brothers and I weren’t especially thrilled to work in the restaurant, not when there were more pressing matters that demanded our time, like the premier of the newest Molly Ringwald movie or a Duran Duran concert.3 But mom and dad knew best, and we worked at the restaurant after school and on weekends. We learned how to do it all: wash dishes, clean floors, wait on tables, nap standing up, and cook.4 The most important thing we learned is that a restaurant is more than the sum of its parts or a place people go just because they are hungry. We learned that every customer in the restaurant is a guest in your home – a friend, a neighbor, or a member of the family who has come over for great food and a memorable time. And like family, no one should ever walk in without a warm greeting to be followed by the best meal they ever ate. 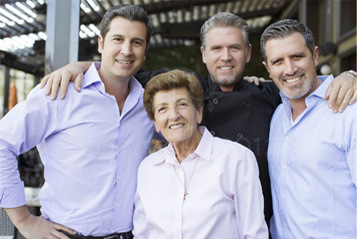 It took a while, but we learned our mom’s way of dedicated care and we acquired her passion for this business of food and drink. Now, we come to the restaurant every day because it’s what we love to do, and not because we’ll be grounded if we don’t. We couldn’t imagine doing anything else. We want Jack’s to be the kind of place our mom and dad would be proud to call thier own. We’re here seven days a week. We want you to feel comfortable coming in any time. All of those days. For breakfast, lunch or dinner. We want to be the place you come to for an omelet and coffee before work, a cocktail and appetizers after, a quick bite for lunch or dinner, or a burger and a beer before or after the movie.5 We want to be the place for a dressed-up meal when you’re trying to impress that special someone. And we want to be the place where you hold your business meetings or celebrate life’s milestones — birthdays, graduations, engagements, weddings and more. We want Jack’s to be your favorite restaurant, the place where whatever the time or occasion, you know that a great meal, friends and family await. Thanks again for joining us at Jack’s. 1. By the way, Dave and I are twins. 2. We named Jack’s after Dave’s son. We name it after him in part because, when he’s a teenager and old enough to work here, we think he won’t complain as much when we don’t pay him. 3. Or to buy parachute-pants. Still a great look. 4. Dave took after our mom and just knew how to cook. Chris and I took after our dad, and just didn’t. 5. If you’d like a cocktail before work, we won’t tell anyone.